It is important to have people in your life who can give you a good pep talk when you are feeling down. Having this support can be truly helpful and really affect your mood and outlook on the future. Some people excel at giving pep talks, while others struggle to find the right words or inspirational tone. 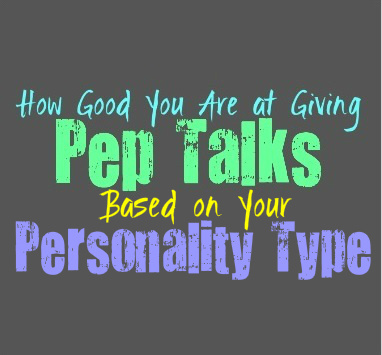 Here is how good you are at giving pep talks to others, based on your personality type. INFJs are often very supportive people, who do their best to help out the people they love. INFJs don’t like seeing people feeling down or struggling, especially someone they care for deeply. They do their best to life people when and can often give a good pep talk when needed. INFJs can be good at combining honesty with a sense of positivity, in order to help people move forward. They understand that sometimes they need to show sympathy and let someone know they can see their struggles, but also express that they believe in them and they know they can be successful. ENFJs are supportive and compassionate people who do their best to help those around them. When they see that someone is struggling to succeed the ENFJ does their best to inspire them. Giving pep talks often comes naturally for them, which is why they would often make for great motivational speakers. ENFJs know how to show a sense of compassion and understanding, which actually helps people feel more inspired instead of condescended to. ENFJs will do whatever they can to give the best pep talk and really help someone feel like they can move forward. INFPs are often better at taking time to mope and really let someone feel down when they need to. They are good at standing by someone in solidarity and being honest with them completely. This can sometimes make it difficult for them to give pep talks, since they prefer to be sincere about the situation and how they are feeling. On the other hand, INFPs believe in their friends and loved ones and can often talk them up in a more personal sense. They will be good at telling them how amazing they are, and helping them find this inner strength. ENFPs are great at being inspirational, especially when they want to be. There are times when they can find themselves being a bit too distracted to really give the right kind of pep talk though. ENFPs can be all over the place with their thoughts and sometimes this can leave them struggling to really give the pep talk someone is looking for. When the ENFP is on point and on focus they can be great at giving pep talks. They know about their loved ones rather well and can really help inspire them to believe in themselves much better. INTJs aren’t really the people you think of when you want a good pep talk. They are certainly great at giving helpful and honest advice, and will do their best to help people more towards the right direction. INTJs know how to approach things from a logical point of view, and so giving some sort of inspiration pep talk just isn’t fitting for them. They would likely struggle if it felt insincere for them, and so having to put an overly positive spin just isn’t something that comes naturally. INTJs do know how to point people in the right direction and help them out, but it isn’t necessarily given in the form of a pep talk. While ENTJs are very direct and honest people, they can give pep talks in the right circumstances. They are natural leaders and so sometimes this means having to give a pep talk in order to bring the team together and inspire them in the right direction. ENTJs know how to be hard and direct, but they also know how to give the right pep talk to get people moving forward. ENTJs will do their best to give the right pep talk for their team or group, since they focus mainly on efficiency and getting things done no matter what that requires of them. INTPs aren’t necessarily great at expressing things emotionally, and so giving pep talks can sometimes be a struggle for them. This is something INTP aren’t likely to be good t when they are younger, since it might make them feel a bit nervous. When they get older they might work on developing this skill, especially with the people they truly care for. When they are connected to someone they often know them well enough to express and honest and compassionate pep talk. It is likely to be something simple and not too over the top, but for some people the way the INTP tries to build them up can actually be helpful. ENTPs are rather honest and precise people and so sometimes they might struggle to be great at giving specific pep talks. They can be good at showing a sense of compassion and being there for their loved ones, but feeling forced to give some sort of hokey inspirational chat can feel a bit insincere. ENTPs believe in showing support in their own way and this doesn’t always come in the form of a direct pep talk. They can often be there for their loved ones and might try to lift someone up with a sense of humor and making things a bit lighter. ISTJs aren’t naturally good at having to give emotional pep talks, but they are often good at helping people. They are direct and often practical people who can find solutions to most problems in front of them. The ISTJ will do their best to inspire their loved ones to push on when they are struggling, and will try to help them find the right path to take. Giving a pep talk which is over the top and emotionally driven, just isn’t their strong point. For them it is best to be honest and straightforward in order to help others excel. ESTJs are natural leaders and so sometimes they need to know how to give the right pep talk. They can often stay positive and find the way to be as efficient as possible with the task at hand. While ESTJs aren’t the most emotionally driven people, they can do their best to push others in the right direction. Sometimes their pep talks can be a little direct and maybe intense, but the ESTJ will do what they can to get the job done and help others feel motivated to succeed. ISFJs are often great at giving pep talks, and will adjust depending on the person they are speaking to. They do whatever it takes to inspire their loved ones and help them feel motivated towards the future. When the ISFJ cares for someone they want to see them excel and become successful in life. They are often great at finding the right words and sense of compassion which will help those around them feel inspired and motivated towards the future. ESFJs are compassionate people who do whatever they can to help and inspire their loved ones. They want to help them move forward and follow the right path. When the ESFJ cares for someone they want to see them happy, and so they will be great at tailoring a pep talk to their personal needs and behaviors. They are good at understanding people and what they want from life, and this can really help the ESFJ find the best words to help someone feel motivated and inspired. ISTPs don’t usually find themselves inclined to give pep talks, since it can feel a bit hokey to them. They prefer to focus on being direct and are often good at solving problems. They might be able to give someone helpful advice using facts and logic, but having to bring in a more compassionate point of view isn’t natural for them. While ISTPs care for their loved ones, they just aren’t drawn to expressing themselves in more emotional ways. Having to give a pep talk can feel insincere sometimes, especially if it feels like they are required to do this a certain way. ESTPs can be surprisingly good at pep talks, but sometimes their desire to be factual and precise can get in the way. They know how to be supportive of their loved ones and can actually be rather compassionate towards their needs. While ESTPs know how to be there for the people around them, there are times when their logical minds can get in the way. If they see this person is making mistakes they might try to fix the problem, instead of simply giving them an inspirational pep talk which helps them feel confident. ISFPs are often good at helping their loved ones feel better about themselves, and so they can be rather great at pep talks. For the ISFP it can be hard to give pep talks to strangers, since it lacks a sense of personalization. They are better at giving these talks to people they know, since they want to be able to connect with them and find a way to be completely honest about their pep talk. ISFPs often believe in their loved ones and can really see the good in them, which helps them to build confidence in those people. ESFPs are actually great at giving pep talks, and can inspire a sense of confidence in others. They know how to life people up and bring a more positive feeling to the room. When someone is feeling down about themselves the ESFP often knows the right words to help others feel more positive and ready to move forward. They are often excellent at giving pep talks, even if others might feel like things are hopeless.